How do you know if things are on their way after you have asked for them? What should you do after using a particular manifestation technique? What does evidence of your impending manifestations feel like? 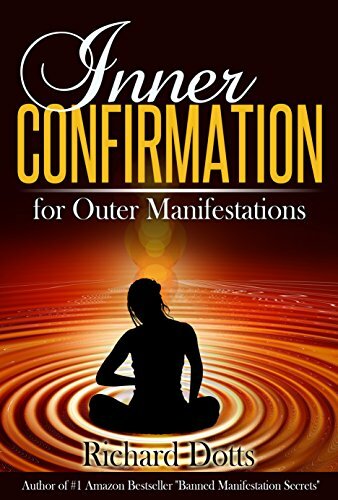 You may not have seen yourself as a particularly spiritual or intuitive person, much less an energy reader… but join best-selling author and spiritual explorer Richard Dotts as he explains in Inner Confirmation for Outer Manifestations how everyone can easily perceive the energy fields around them. In this latest book, Richard explains how everyone is born with the ability to perceive and work with the energy fields around us. We are constantly doing so to shape our reality whether we realize it or not. In fact, these energy fields hold the very keys to effective manifestations. By learning how to check in to and observe our inner states from moment-to-moment, we can gain valuable insights into whether our manifestations are coming into form in desired ways. In his trademark illuminating and conversational style which has endeared him to readers worldwide, Richard explains how his traditional “scientific” upbringing caused him to turn his back away from these “energetic” esoteric teachings in favor of more pragmatic sources. But eventually, a series of serendipitous events as described in the book made him realize the sheer impossibility of being a conscious creator while denying the fact that we are all energetic beings at our core! Learn as Richard explains how to look into your inner (not outer) world for actual, tangible evidence of your manifestations… and how you can literally feel the energy as your manifestations snap into place for you. When you learn how to drop into and become more aware of your inner states, a whole new world of possibilities opens up for you as a creative manifestor.